MedellintheFilm.com – How HBO is Using Buzz Marketing for a Movie That Hasn’t Been Made on a TV Show That Isn’t Real, Or is It? If you have HBO, then chances are you watch Entourage. How can you not love this show, right? It gives you a view into the life of a big time actor in Hollywood and all the craziness that goes along with it. I’ve watched the show since its first episode and I’m glad we started then! For those of you who don’t know Entourage, here’s a quick rundown. Vincent Chase is an up and coming actor (actually a star by now.) He grew up in Queens and brought his buddies out to Hollywood with him (his entourage). You get to follow Vince and his entourage through landing movie deals, spending exorbitant amounts of money, dealing with big time agents, producers, and directors, and encountering all sorts of eclectic folks in Hollywood. In addition, there are many cameos from Hollywood stars, which adds a genuine feel to the show. It’s a fun ride! Watch it if you don’t already…you won’t be disappointed. HBO Creating Buzz About a Fictional Movie Getting Buzz on the Show, Which Might End Up Creating Enough Buzz to Yield a Real Movie! What? Phew, now that’s a tough sentence to get out. As part of the storyline, Vince Chase finds a script he loves called Medellin about the notorious drug villain Pablo Escobar. He wants the movie bad enough to buy the script for millions of dollars, ends up as executive producer (along with his buddy named “E”), hires a loose cannon director named Billy, and shoots the movie in South America. As a viewer, you take a journey through the making of a movie, including all of the nail biting situations that real producers go through. You almost start to believe that this is actually going to be a movie… More on this later. As part of the last episode, the trailer for Medellin gets leaked onto YouTube, and the world starts to see the masterpiece (or bomb) that Vince and E produced. By the way, that was on the show, but someone really leaked the trailer on YouTube…smart move. I won’t go into the granular details of the episode or storyline, but it’s hilarious to see the behind the scenes moves of agents, producers, directors, and what goes on in Hollywood in general. Again I recommend watching it! So, someone leaked the trailer on YouTube and it started getting a ton of views. Great buzz marketing tactic, right? Was it leaked? Was it a ploy? Who knows, but heck, it’s a TV show! At the end of the last episode, where you typically watch scenes from the following week, you were hit with what seemed to be the beginning of a movie trailer. I was really surprised… What was this?? It was the trailer for Medellin. Brilliant! We watched it 3 or 4 times, again, starting to get sucked into the real, sorry fictional, world of Entourage. :) At the end of the trailer, they flashed the website URL for the movie, medellinthefilm.com. OK, we’re there! There are 30 million subscribers to HBO, so how many people do you think ran to their computers like we did to visit the official website of Medellin? How many people started blogging about it (like I am now)? Digg already has a bunch of stories about it, and I’m sure the original story was from someone at HBO! We first typed medellinthemovie.com and ended up at some weird site that had nothing to do with the show or movie. Then I quickly found a blog post explaining that many people were entering the wrong URL, and that it was actually medellinthefilm.com. Again, keep in mind, this is for a fictional show and a movie that’s part of a fictional show… The official site must have received a ton of visitors over the past few days. With one, 90 second trailer at the end of a show, HBO started a craze on the web to find the trailer, the site, and this all generated serious bzz on blogs, forums and social media sites ALL ABOUT A MOVIE THAT’S NOT REAL! 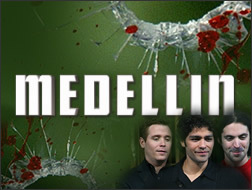 HBO might generate enough buzz that Medellin the movie could actually get made. Heck, if you were HBO, wouldn’t you create an original film knowing that millions of people are already on board? Wouldn’t it be wild if Vince Chase stars in the movie? Remember, there is no Vince Chase…he’s a character in Entourage. Confused? I believe there’s a lot to learn about Buzz Marketing and Amplified WOM from this example. Leave it to HBO get people buzzing about a movie that hasn’t even been shot yet! …And all on a TV show that walks a fine line between fact and fiction, and with real, I mean fictional characters, agents, and directors in the wonderful world of Hollywood. Keep watching Entourage, try to find your own Ari Gold, root for Drama because there’s no hope, laugh at Turtle so HBO keeps him on the show, be as bold as E, and eat up risk like Vince Chase…all from the comfort of your own home!